The original Caesar salad didn't contain anchovies, though they're now considered all but mandatory. Here's my version of a Caesar that's perfect for winter. Frying the anchovies in the rendered bacon oil gives the salad a rich umami hit that is hard to beat. 1. Preheat oven to 180C. Trim the stalks from the kale and tear the leaves into small pieces. Toss the sourdough and kale with the garlic and half the olive oil. Spread onto a baking sheet in a single layer and bake for 15 minutes until the croutons are browned and the kale is crisp. Place the eggs into boiling water and boil for 6 minutes. Refresh in cold water, peel and halve. 2. Finely shred the brussels sprouts (preferably with a mandoline, but a sharp knife will do fine as well). Heat a little of the remaining olive oil in a large frying pan over medium-high heat and fry the bacon until crisp. Remove from the pan with tongs, reduce the heat to medium-low and add the chopped anchovies. Fry until the anchovies are crisp, turn off the heat and add the remaining oil. Whisk in the Worcestershire sauce, mustard, honey and lemon juice. 3. 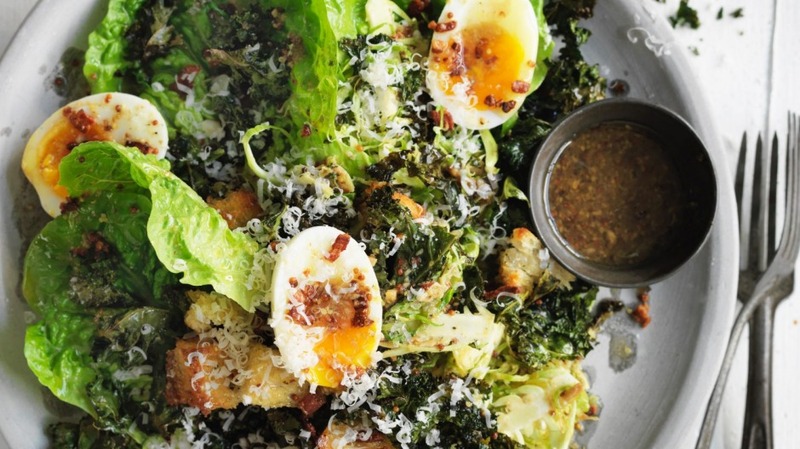 Toss the crispy kale, sprouts, lettuce and bacon together and arrange on a serving plate. Pour over the warm dressing, then top with the eggs, whole anchovies and croutons, and scatter generously with the parmesan. Pair this delicious salad with Adam Liaw's mocha semifreddo with bulletproof popcorn for the perfect midweek meal.